In November I watched a solo show by Jan Stroomer. He was introduced as singer and composer of the Leiden based band The Stream. (http://wonomagazine.blogspot.nl/2014/11/jan-stroomer-en-mieke-van-veen-in.html) Although his solo show was very entertaining there was not much in the solo show that prepared me for Art nouveau. An image had popped up in my mind that had not much to do with the music on the album. I had expected piano singer-songwriter songs like Billy Joel, Elton John or even Randy Newman. Hearing Art nouveau I'm doubly sorry that I could not make the show in Leiden on 10 January. Another party got in the way (also a lot of fun). Art nouveau opens with a real 'Ouverture'. Some symphonic rock ideas got into my mind. Definitely the British variety, like ELO and Marillion, but without the super pumped-up sound. The Stream downplays its music, in a very pleasant way. Still with the 'Ouverture' on display The Stream caught my attention. That was just as well, as The Beatlesque 'Confusion' made Art nouveau speak volumes. In the vocal melodies there are clear The Beatles influences, where the music is much more 70s. Somehow larger and more complex in another way than The Beatles managed to be complex, the chord changes and fluent vocal melodies. Add a tough guitar sound and solo, by Nils van Grevenbroek, to the mix and there is a distinctive sound that calls up pleasant memories and adds something new straight away. 'Another time and place' is based on the piano, but keeps up a stark pace. It is only in, yes 'Slow down', that the album relaxes somewhat in a very convincing rock ballad. At this point in the album I also notice that I have to make some effort to keep attached to Jan Stroomer's voice. There is something bothering me, slightly, but it does. After listening some more I notice that it's the same accent in the English as my son has. The same teacher? Or have I discovered Leiden's take on English? It has nothing to do with the music and melodies so I could easily leave this point behind me. "Why don't we talk it over. No, that's over now". This line from 'This dream is over' has a clear reference in melody to 'Sorry seems to be the hardest word'. Like one of Elton John's finer songs, 'This dream is over' touches upon the right mood for a song like this. The string section underscores the emotions. Deep drama is poured out over the listener. There certainly is an Elton John flavor to Art nouveau, but unlike John's albums, Art nouveau doesn't make me itch and scratch. Lyrically 'Time for some changes' appears to be in the wrong place on the album as 'This dream is over' precedes it, but who knows how relationships develop? Musically it is an upbeat song with some Queen references. A subdued 'Lazing on a Sunday afternoon'. The Stream is not afraid of making its favorites shine through. The band has found the right balance here, as the influences do not get into the way of its own songs and sound. They do not disturb in the least and add to the pleasure of listening to Art nouveau. The album keeps its own quality. Not in the least because of Jan Stroomer's fine piano playing, that leads when possible and takes a step back to weave itself into the sound as a whole. Only 'True love' goes over the edge as far as I'm concerned. Too sweat to my taste. The two final songs, 'Losing control' and 'I won't forget', make more than up for this sugar sweet song. Again The Moody Blues come to mind, to mention a final influence (o.k., let me add Midlake as well). 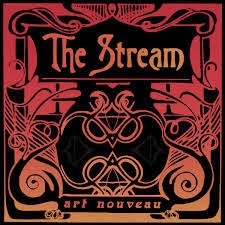 Like this band The Stream is not afraid of throwing the listener off kilt with a few changes within a song, while maintaining complex vocal counter melodies in 'Losing control'. The Stream released an album that has merit. And it is a fair question to ask what Art nouveau had sounded like with a higher budget. Just imagine a little bigger sound, a few instruments that come out just this little better. And perhaps this is just my imagination, as so much care was laid in the details of Art nouveau. A lot of work obviously went into the arrangements, which makes Art nouveau a rich album. Can a DIY album come closer to perfection? Patrick Joseph's 'Moon king' recently showed so, but Art nouveau deserves a lot of credit. A fine album!